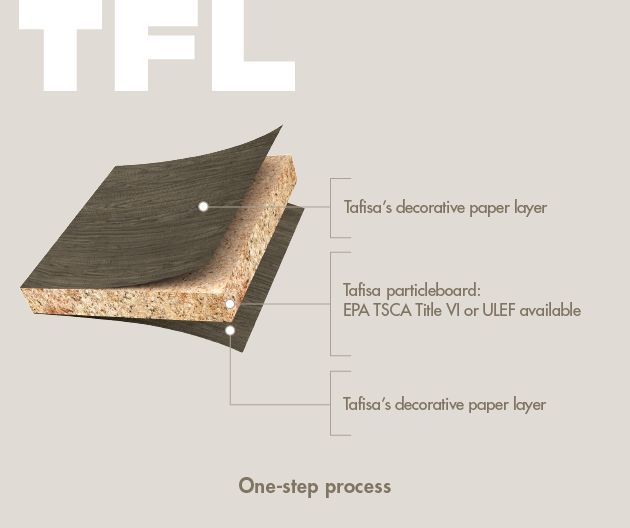 Tafisa® Canada's decorative panels (TFL) are manufactured using 100% recycled and recovered wood materials. Available in more than122 standard colour and texture combinations. It comes with a complete, harmonized line of HPL to our TFL Prelude and Sommet embossed in-register (EIR) Series. Besides, the collection comes with the most comprehensive complementary products program of the industry. The table below gives the corresponding textures of Tafisa®'s TFL (Decorative Panel) and Surforma®'s HPL (High-Pressure Laminates). TFL decorative panels are manufactured in one step. Top and bottom impregnated decorative layers are pressed and permanently thermofused to particleboard or MDF. Large steel press plates are used during this process to create the surface texture. The finished panels are ready for use.